High fat + high carbohydrate foods like mini doughnuts are exactly what you should not eat on a refeed day, let alone during weeks of bulking. 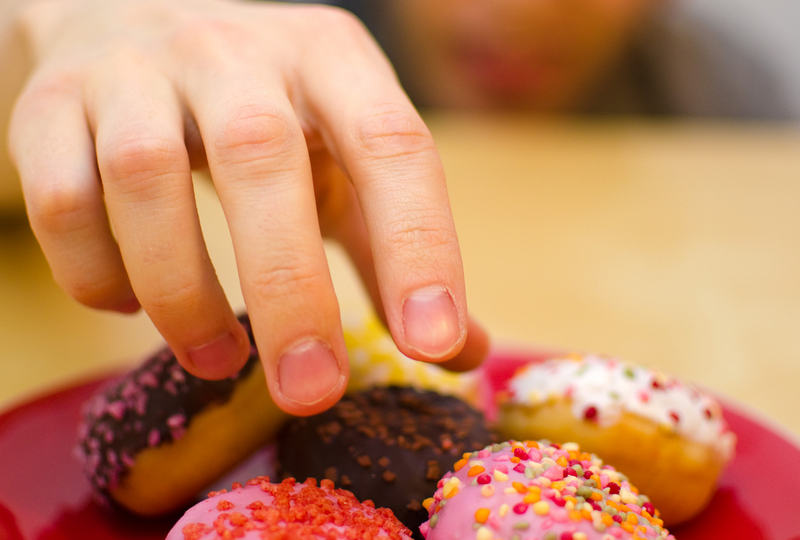 Do you want to know what happens during days and weeks of gluttony? How the effects "bulking" will have on your body weight and composition, depending on where those extra calories come from? Have you wondered what the optimal nutrient composition on refeed days may look like? 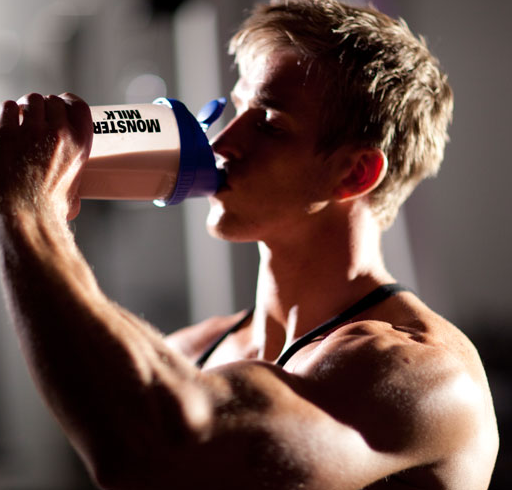 And are you concerned about the potential the health consequences of bulking? Yes? In this case, I would suggest you take a closer look at the following overview of the research. An overview that is probably not complete, but it should suffice to provide preliminary answers to the aforementioned questions. How many Carbs Before Fat is Unhealthy? The amount of weight you gain depends on your genes: They are not the only determinant. That's for sure. A 1990 study by Bouchard et al. still leaves no doubt that your genes are one of the most important determinants of the quantity of weight you gain. In said study the researchers from the Laval University fed 24 sedentary young male twins 1,000kcal extra for six out of seven days of the week. In that, the study is not the first to investigate the effects of overfeeding on weight gain in twins. It is yet the first and only one that did this over a period of 100 days and thus with a total energy excess of 84,000 kcal on a diet that contained 50 percent carbohydrate, 35 percent fat, and 15 percent protein. Figure 1: Comparison of the weight (left) and visceral fat (right) gains in twin pairs; high correlations were observed for both, but the correlation was significantly more pronounced for the unhealthy visceral fat than it was for the mere body weight (Bouchard. 1990). The data in Figure 1 does probably not need any extra explanations. In view of the fact that similar results have also been observed in previous studies like Poehlman et al. (1986), it should be obvious that the difference between the weight (left) and visceral fat (right) two identical twins gained was significantly smaller the difference between one twin from pair A and one twin from pair B. The statistical analysis of body fat and waist circumference data revealed similar correlations which were most significant for the visceral fat mass and the waist hip sizes, i.e. those quantities that predict the ill health effects of weight gain best. According to Ukkola, et al. (2001), the genetic differences may partly be mediated by differences in the genetic make-up of ones beta-2 adrenoreceptors with specific variants being associated with greater increases in insulin resistance, body weight, and subcutaneous fatness. Other candidates are the cholesterol ester transfer protein (CETP) gene which appears to affect adiposity in response to long-term overfeeding (Terán-García. 2008). Other scientists use similar genetic polymorphisms to explain a general resistance to weight gain during overfeeding via genetically determined variations in nonexercise activity thermogenesis (Vanltallie. 2001). Overfeeding fat, carbohydrate or protein, does it make a difference? Studies that compare isocaloric overfeeding are quasi-non-existent. What we do have are studies like the one by Horton et al. (1995) that compared high fat vs. high carbohydrate diets (see Figure 2 for macronutrient composition), where the additional energy came from fat or carbohydrates. In the Horton study, this was a 50% extra that was added in form of fat or carbohydrates on top of the baseline diets of the normal-weight and obese subjects. A 50% extra that leads to significant weight gain. Figure 3: Weight gain (left) and increase in energy expenditure (right) in obese and lean subjects in response to carbohydrate and fat overfeeding (Horton. 1995). As you can see in Figure 3, both diets led to a rapid increase in body weight, but the trajectory was different. The main and maybe practically relevant difference, though, was that the rapid increase in water and glycogen in the high carbohydrate group was less resilient weight loss in the post-overfeeding period. No! Carbs are not necessarily more fattening in the obese. It's a commonly held prejudice that carbohydrates are more readily converted to fat and stored in the obese, but a study by Minehira et al. that investigated just this found that there was not just no difference in de novo lipogenesis with carbohydrate overfeeding between lean and obese individuals, there was also no increase in de novo lipogenesis, at all, when the when the obese subjects were overfed with a high carbohydrate diet for one day (Minehira. 2004). 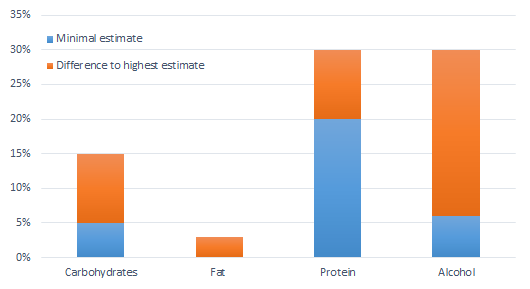 Figure 4: Proportion of the energy that was stored as body fat (Horton. 1995). If we take a look at the proportion of energy that was stored as body fat in Figure 4, it is obvious why the fat gains lasted longer than the carbohydrate gains. Why? 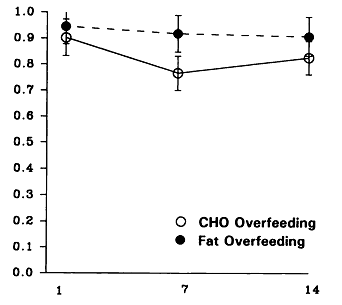 Well, simply because the 14-day overfeeding on fat lead to a significantly higher relative increase in body fat. 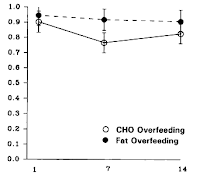 Last but not least, it may also be worth mentioning that the fat gain in the obese group was 89% and 57% higher in the carbohydrate and fat overfeeding group, respectively. An intriguing result that appears to stand in line with dieting studies, where high-fat diets are superior to high carbohydrate diets in the obese, but not in lean individuals. What was not different for obese and lean individuals, though, was the fact that the carbohydrate overfeeding lead to higher gains in lean mass than the fat overfeeding. A result that should remind you of a previously reported study here at the SuppVersity, in which a no fat bulk lead to significantly greater muscle and significantly lower fat gains than a low-fat bulk (see "If You Go "High Carb", You Better Go Really High!" | more). Overall, "bulking", i.e. eating more than you need on any mixed diet, has repeatedly been shown to produce significant increases plasma Somatomedin-C/Insulin-like Growth Factor (SM-C/IGF-l) and testosterone concentrations as well as insulin, of which Forbes et al. speculate that they promote the lean mass increases that are particularly pronounced when overfeeding is combined with resistance training. In a more nutrient-type specific study b by Dirlewanger that did not focus on the weight gain or anabolism, but on the leptin response and the increase in resting energy expenditure the subjects experienced a significant increase in leptin (+28%) and resting energy only in the high carbohydrate, yet not in the fat overfeeding arm of their study in young, lean individuals (Dirlewanger. 2000). Other studies, without clear distinction between high carb and high fat overfeeding, indicate that fast food like burgers or fries is an effective short-term leptin stimulator, too - at least if it's consumed in a single binge (Kolaczynski,. 1996). 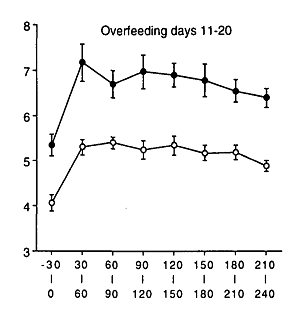 Figure 5: Energy partitioning in young men upon overfeeding with ~5,000kcal per day - mostly carbohydrates, i.e. 1% protein, 3% fat, and 86% carbohydrate (Acheson. 1988). In the short run, like on refeed days, for example, carbohydrate overfeeding has another advantage over fat overfeeding, because it takes roughly 500g of carbohydrates (that's 2,000kcal) before even a single gram of those carbs is converted to fat and potentially, but not necessarily stored as body fat (Acheson. 1988) - at "only" 400kcal extra from carbs for one day there was no net lipogenesis at all (see Figure 5). This result is corroborated by data from McDevitt et al. 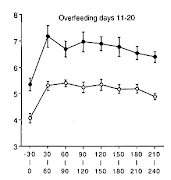 (2000) who observed that the fat gain with fat overfeeding starts with day 1, while there is a time gap in the increase in body fat with carbohydrate overfeeding (McDevitt. 2000). If you consume sugar on a refeed, should you prefer glucose, sucrose or fructose? In view of the fact that I don't suggest you refeed more than 1-2 days and considering the fact that you want to get the majority of your carbs from starches on a true bulks, it does not really matter. In fact, studies show no difference in de novo lipogenesis in 96h overfeeding studies between pure glucose and sucrose, which is a 1:1 combination of fructose or fructose in two studies in lean and obese women by (McDevitt. 2000 & 2001). In the long run, consuming amounts of fructose you could only get by drinking a couple of bottles of coke every day, will yet not be favorable for your health - even if taking fish oil can blunt the increase in hepatic de novo lipogenesis, it won't blunt the insulin resistance (Faeh. 2005). Figure 6: Schematic representation of the main lipid metabolic pathways affected in skeletal muscle during 4 weeks of fat overfeeding. Genes indicated in white boxes were down-regulated during the dietary study, whereas genes indicated in gray boxes were up-regulated (Meugnier. 2007). Fat overfeeding, on the other hand, has been shown to favor fat storage not just because the dietary fat can be stored without being converted to triglycerides, but also because metabolic and genomic investigations show that the lipid oxidation rate tends to decrease, and 55 genes in the skeletal muscle were modified. Modifications of which Meugnier et al. show that they stimulate the synthesis of triacylglycerol, inhibit lipolysis and reduce the oxidation of fatty acid oxidation while promoting the development of adipocytes with an excess of only ~550kcal/day from fat per day (see Figure 6). Another potential explanation is the change in thyroid hormones, of which the data in Figure 7 from an overfeeding study by Danforth Jr., et al. (1979) tells you that the high protein overfeeding despite a 29.8% lower total energy intake triggered the most, the carbohydrate diet the 2nd most favorable (=in favor of greater energy expenditure) effects on the thyroid hormone. Figure 7: Effects of overfeeding with carbohydrates, fats, and protein on thyroid hormones (Danforth, Jr. 1979). Accordingly, high protein diets, of which we know for sure that they are the most satiating hypercaloric diets (followed by high carb and high fat | Johnstone. 1996) and have the highest thermogenic effect (see Figure 8) and can help dieters avoid the yoyo effect after a diet (Lejeune. 2005), should have the least negative impact on your physique. Figure 8: Estimated thermic effect of carbohydrates fats, protein, and alcohol in % energy of the energy that's ingested in form of the respective nutrients (Joosen. 2006). And in fact, Jose Antonio et al. (2014) have recently been able to show that a diet that contains fivefold more protein than the FDA recommends (4.4g/kg | 307g/day) is not just benign but will, in conjunction with exercise, will have significant beneficial effects on the physique of healthy resistant trained men (learn more). Furthermore, studies indicate that a high protein content may also ameliorate negative effects such as an increase in intrahepatocellular lipid deposition in humans (Bortolotti. 2009). Beware of bulking the way you did in your twenties! It's almost certainly going to make you fat because studies indicate that age correlates with a decreased increase in energy expenditure in response to overfeeding (Roberts. 1996). Since the difference is particularly pronounced on day 1 of the respective overfeeding period (see Figure on the left), I would also refrain from excessive "refeed days" if I were 60+ years old, like the subjects in the study by Roberts et al. from which I grabbed the graph that displays the energy expenditure on a diet that contained 956kcal extra per day (phase II in this study). Classic overfeeding studies with protein as a single nutrient are yet unfortunately rare. Even less, namely nothing, is known about the effects of ketogenic diets, which is why it's at the moment impossible to tell whether a hypercaloric high fat diet that is devoid of carbs and low enough in protein to actually induce ketosis will have the same negative effects as a high-fat diet that still contains 15-30% carbohydrates and some protein. Based on the studies we have, it's yet quite certain that the combination of some carbs and a high amount of fat is the most obesogenic variety of "bulking" you could possibly select. Therefore - with the exception of ketogenic diets, where corresponding data is still missing, the rule of thumb is: The more fat in the diet, the more rapid the body fat, but not necessarily the body weight gain. MCT overfeeding is less obesogenic - The reason that rodents that are overfed with medium-chain triglycerides (Geliebter. 1983) and assumable human beings store less fat than on long-chain triglycerides as you will find them in your bacon, sausages, dairy & co is an increase in thermogenesis that has been observed in both rodent and human studies. Figure 10: Metabolic rate in healthy men after the ingestion of isocaloric fat meals containing MCTs or long chain triglycerides (Hill. 1989). As you can see in Figure 10, this effect does not diminish over time - at least, when only the effect of the infusion of MCTs versus long-chain fatty acids is concerned. In view of the rodent study by Geliebter et al. (1983) and the results of the study by Hill et al. (1989), it appears to be quite obvious that MCTs constitute a valuable addition to hypercaloric diets. The often-heard claim that they cannot be stored as fat is yet misleading - even if they are oxidized in the liver, the increase in available energy will increase the storage of energy from other nutrients. The dream of eating as much as you want without gaining weight does, therefore, remain a dream - at least for all of us who don't harbor a gene defect that blunts the storage of fat. 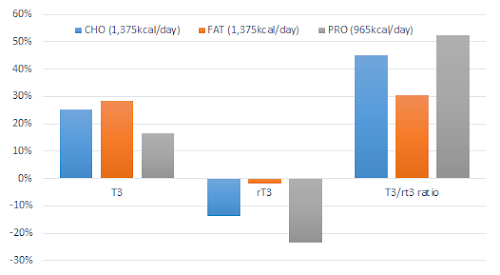 Still, in theory, it would appear as if using MCTs in a dieting context makes sense. In reality, studies have shown that using MCTs as a major source of your dietary fats does not lead to significant long-term improvements in fat or general weight loss - even if 27% of an 800kcal/day starvation diet were pure MCT oil (Yost. 1989). Alright, so what's the bottom line, then? I guess, in view of the fact that we still have few studies on high protein overfeeding and no studies on overfeeding on ketogenic diet, a conclusive bottom line cannot be reached, yet. What appears to be true, though is that a diet containing some carbohydrates and large amounts of fat is the worst choice you can make when you are bulking. A protein and a high(er) carbohydrate, as well as a correspondingly low(er) fat content, on the other hand, appear to be the way to go at least in the short run. In the long(er) run, on the other hand, the differences between higher fat and higher carbohydrate overfeeding appears to disappear - albeit with a small, but potentially practically significant difference in terms of the amount of body fat you will gain (see Figure 4) | Comment on Facebook! Acheson, K. J., et al. "Glycogen storage capacity and de novo lipogenesis during massive carbohydrate overfeeding in man." The American journal of clinical nutrition 48.2 (1988): 240-247. Antonio, Jose, et al. "The effects of consuming a high protein diet (4.4 g/kg/d) on body composition in resistance-trained individuals." Journal of the International Society of Sports Nutrition 11.1 (2014): 19. Bouchard, Claude, et al. "The response to long-term overfeeding in identical twins." New England Journal of Medicine 322.21 (1990): 1477-1482. Danforth Jr, E., et al. "Dietary-induced alterations in thyroid hormone metabolism during overnutrition." Journal of Clinical Investigation 64.5 (1979): 1336. Dirlewanger, M., et al. "Effects of short-term carbohydrate or fat overfeeding on energy expenditure and plasma leptin concentrations in healthy female subjects." International journal of obesity and related metabolic disorders: journal of the International Association for the Study of Obesity 24.11 (2000): 1413-1418. Faeh, David, et al. "Effect of fructose overfeeding and fish oil administration on hepatic de novo lipogenesis and insulin sensitivity in healthy men." Diabetes 54.7 (2005): 1907-1913. Forbes, Gilbert B., et al. "Hormonal response to overfeeding." The American journal of clinical nutrition 49.4 (1989): 608-611. Geliebter, Ae al, et al. "Overfeeding with medium-chain triglyceride diet results in diminished deposition of fat." The American journal of clinical nutrition 37.1 (1983): 1-4. Hill, James O., et al. 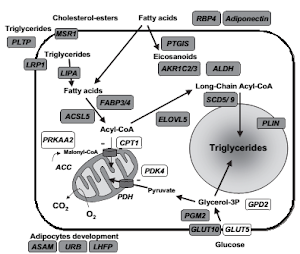 "Thermogenesis in humans during overfeeding with medium-chain triglycerides." Metabolism 38.7 (1989): 641-648. Horton, Tracy J., et al. "Fat and carbohydrate overfeeding in humans: different effects on energy storage." The American journal of clinical nutrition 62.1 (1995): 19-29. Johnstone, A. M., R. J. Stubbs, and C. G. Harbron. "Effect of overfeeding macronutrients on day-to-day food intake in man." European journal of clinical nutrition 50.7 (1996): 418-430. Joosen, A. M., and Klaas R. Westerterp. "Energy expenditure during overfeeding." Nutr Metab (Lond) 3 (2006): 25. Kolaczynski, JERZY W., et al. "Response of leptin to short-term and prolonged overfeeding in humans." The Journal of Clinical Endocrinology & Metabolism 81.11 (1996): 4162-4165. Lejeune, Manuela PGM, Eva MR Kovacs, and Margriet S. Westerterp-Plantenga. "Additional protein intake limits weight regain after weight loss in humans." British Journal of Nutrition 93.02 (2005): 281-289. McDevitt, Regina M., et al. "Macronutrient disposal during controlled overfeeding with glucose, fructose, sucrose, or fat in lean and obese women." The American journal of clinical nutrition 72.2 (2000): 369-377. McDevitt, Regina M., et al. "De novo lipogenesis during controlled overfeeding with sucrose or glucose in lean and obese women." The American journal of clinical nutrition 74.6 (2001): 737-746. Meugnier, Emmanuelle, et al. "Changes in gene expression in skeletal muscle in response to fat overfeeding in lean men." Obesity 15.11 (2007): 2583-2594. Minehira, K., et al. "Effect of carbohydrate overfeeding on whole body macronutrient metabolism and expression of lipogenic enzymes in adipose tissue of lean and overweight humans." International journal of obesity 28.10 (2004): 1291-1298. Poehlman, Eric T., et al. "Genotype-controlled changes in body composition and fat morphology following overfeeding in twins." The American journal of clinical nutrition 43.5 (1986): 723-731. Roberts, Susan B., et al. "Effects of age on energy expenditure and substrate oxidation during experimental overfeeding in healthy men." The Journals of Gerontology Series A: Biological Sciences and Medical Sciences 51.2 (1996): B148-B157. Terán-García, Margarita, et al. "Effects of cholesterol ester transfer protein (CETP) gene on adiposity in response to long-term overfeeding." Atherosclerosis 196.1 (2008): 455-460. Ukkola, Olavi, A. Tremblay, and C. Bouchard. "Beta-2 adrenergic receptor variants are associated with subcutaneous fat accumulation in response to long-term overfeeding." International journal of obesity and related metabolic disorders: journal of the International Association for the Study of Obesity 25.11 (2001): 1604-1608. Vanltallie, Theodore B. "Resistance to weight gain during overfeeding: a NEAT explanation." Nutrition reviews 59.2 (2001): 48-51. Yost, Trudy J., and R. H. Eckel. "Hypocaloric feeding in obese women: metabolic effects of medium-chain triglyceride substitution." The American journal of clinical nutrition 49.2 (1989): 326-330.